The final table of the $5,000 No Limit Hold’em Shootout(Event #6) in the 2010 World Series of Poker (WSOP) is set. Six players are left standing, two of which are members of the online poker community. Joe pokerjoe9Elpayaa (pictured at right) survived a marathon five-hour heads-up battle with Cary Katz to advance to the final table. Also reaching the finale and having a one in six shot at a bracelet is Brent bhanks11Hanks, who defeated Josef Monro before the dinner break began. Let’s take a look back at Wednesday’s action in the 2010 WSOP. On Tuesday, Elpayaa’s final heads-up opponent in the $5,000 No Limit Hold’em Shootout was none other than Full Tilt Pokerpro and 2009 WSOP Main Event November Niner Phil Ivey. In the duo’s final hand, Ivey was all-in with pocket nines and up against the K-Q of Elpayaa. 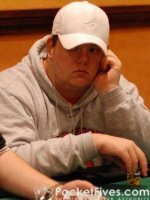 The PocketFives.com member flopped a queen and the other four cards all came seven or lower to advance Elpayaa and send Ivey home. On Wednesday, Elpayaa’s table draw didn’t get any easier. 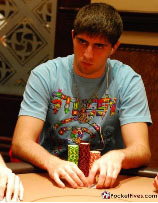 Joining him at Table 369 were reigning World Poker Tour (WPT) Festa al Lago champ Tommy Vedes, Katz, 2008 WSOP Main Event November Niner David “Chino” Rheem, Brent Wheeler, and fellow online poker player Keven StamdoggStammen. For Hanks(pictured at left), Wednesday’s starting table included WPT Bellagio Cup final table member Justin Boosted J Smith, reigning WPT Player of the Year Faraz The-Toilet Jaka, Maxim Lykov, Monro, and Joe McGowan. Like Elpayaa’s match against Ivey, Hanks advanced to the final table after coming out on the winning end of a race, this time with pocket eights against A-10. The board fell 7-5-3-Q-3 and Hanks survived. The six players left are guaranteed to bank at least $72,000, with the winner taking home $441,000 and the all-important WSOP bracelet. Joining Elpayaa and Hanks at the final table on Thursday will be Stuart Rutter, poker veteran Neil Channing, Nicolas Levi, and Josh Tieman. Three of the six hail from the United Kingdom. Plenty of PocketFives.com members cashed in the $5,000 No Limit Hold’em Shootout and scooped $16,000, including Blair blur5f6Hinkle, Stammen, Aaron aaronbeenBeen, Smith, Jaka, and Christian charderHarder. The finale of Event #3, $1,000 No Limit Hold’em, featured Canadian Aadam Daya best American Deepak Bhatti to collect $625,000. Taking fifth was Nick agriffrod Mitchell (pictured at right), who doubled up Bhatti to cripple his stack with K-Q against A-Q. The better hand held and Bhatti doubled through. Then, Mitchell was all-in with 5-4 against Bhatti’s A-7. Mitchell flopped a four, but Bhatti flopped two pair. Despite the assembled crowd ardently rooting for a four, none came on the turn or river and Mitchell earned $154,000. The finale of Event #5, $1,500 No Limit Hold’em, featured David Doc SandsSands (pictured at left) taking eighth place, boosting his net worth by $49,000. In his final hand, Sands ran pocket fours into the pocket jacks of Praz Bansi, who ultimately went on to win the tournament and bank $515,000. Sands is battling with Dan djk123Kelly and Jaka for the seventh spot in the illustrious DoylesRoom Brunson 10, a group of internet stars hand-picked by the legendary Doyle Brunson. Stay tuned to PocketFives.com for the latest WSOP coverage of online poker players. Check out PocketFives.com member cashes.